Far too many healthcare practitioners operate out of size bias and “everybody knows” beliefs about weight and health that are not backed up the research – diagnosing people as “fat” and prescribing “becoming less fat” and telling their patients that everyone who tries hard enough can manipulate their body size and that it will make us healthier to do so, even though this doesn’t meet the criteria for evidence-based medicine or informed consent. This isn’t just annoying for fat patients, it can kill us. And doing activism around this can be difficult because of the power imbalance, and because if you upset your healthcare practitioner it can jeopardize your ability to get the care and/or medication that you need. These differences are exacerbated when multiple oppressions exist including racism, homophobia, transphobia, ableism, healthism, ageism, classism, and other marginalizations. It’s also difficult because when called on these issues, healthcare practitioners (like many of us) have a tendency to get defensive and double down so that you get malpractice with a side of victim-blaming. I want to be very clear that you are never obligated to do activism around this. However you deal with the issues of access and bias that your healthcare practitioner visits upon you, please remember first and foremost that even though this may become your problem it is not your fault and it should not be happening. Whatever you decide to do is a legitimate choice whether that’s engaging in activism and asking your healthcare practitioner to provide research to back up the diet intervention she is recommending, or lying and saying you’ll go on a diet that your doctor says you have to agree to before he’ll treat your broken wrist. But if you’re in a place where you can do activism around this, the good news is that it can be extremely powerful. if we can get a doctor to focus on health instead of weight, if we can get a healthcare practitioner to stop prescribing diets that have no reasonable expectation of success and instead prescribe evidence-based interventions for actual health issues, if we can get a healthcare practitioner to see and challenge their biases about fat people, it changes not just our experience with that doctor, but countless other people’s experiences. If the healthcare practitioner we help decides to help other healthcare practitioners the affect of our conversation can be exponential. 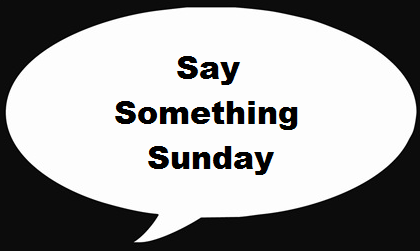 With that in mind, in celebration of another Say Something Sunday, I wanted to share with you a reader’s successful experience working with her doctor. Today I introduced my doctor to HAES, and she seemed interested. She was actively frightened by the idea that a person might choose not to go to their doctor if it meant fat shaming. I offered her some phrases to use and ideas to give her other patients, that don’t focus on weight but rather on healthy choices to make in order to feel good, have energy, treat their health conditions, and forestall problems. I let her know that when a thin person mentions weight to a thick person, there’s so much shaming and bullying in our culture that it will almost always create feelings of defensiveness, shame, fear, all the things that keep a fat person from trusting and utilizing their health care professionals. I agreed with her that there are weights that are indicative of problems such as starvation, force feeding, malnutrition, disordered eating or non-eating…but reminded her that correlation is not causation, and she is now looking into HAES and vowing to be extra vigilant about the ways she verbally approaches patients that are thick. She is 100% on board. I will be keeping her. Woot! I want to emphasize that we never know what approach will work with doctors, so each of us can only do what we can do. That’s why the more of us who are having whatever conversations we’re comfortable with, the better. If you are looking for some resources to use to have these difficult conversations with your doctor, you can find them here. If you do decide to try activism (and remember that you are under no obligation to do so,) remember that all we can ever do is give someone an opportunity to confront and overcome their biases, we are not responsible for the outcome. In other words, if you try and they fail, that’s not on you. Whatever you decide, whatever happens, remember that you deserve compassionate, ethical, evidence-based medical care. Thanks for this post, Ragen. My husband and I are searching for a new doctor as the clinic we’ve been going to has shifted focus and made it abundantly clear they no longer need/want our patronage. Is there an online registry or resource that shares information about non-sizist medical doctors? We’re both SO tired of being told to lose weight before getting any help for whatever malady drove us to need medical attention! Since we don’t have insurance, we can’t afford to keep “trying out” new doctors/practices (at a cost of $400+/- per initial visit) only to find that THIS doctor is even more fat-phobic as THAT doctor! There is a list! You can find it at http://cat-and-dragon.com/stef/fat/ffp.html I hope that you find someone great. It may help if you can bring someone to an appointment with you. I don’t know how doctors feel about this, but I do they suggest bringing an advocate for serious health issues, its possible you can bring one for ordinary visits too. Thank you for this reminder! I had this come up with my doctor this week and I was just sort of stunned since the NP I’d see previously had been so thoroughly awesome (I shouldn’t worry about unexpected weight loss after all, since I’m still “overweight”. Because apparently I will magically stop losing weight once I cross the invisible BMI chart line?). Next time there will be cards.